Join 1pMobile today with your first £10 top-up so you are all set for when the SIM arrives. 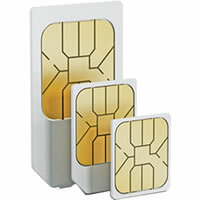 Our triple SIM card is free and it will work in any unlocked 2G, 3G or 4G phone. Please ensure that your phone is not locked to your current provider. Where shall we send your SIM? It is sent by Royal Mail 1st class post and should arrive within 1-3 working days. We'll use this email address to send you your default password and keep you posted about your order progress. 1pMobile is a trading name of Telecommunications Management Limited. Registered in England. Company Number: 3592271. © Telecommunications Management Limited 2019. The Penny character device and the 1pMobile logo are trademarks.